Macdiscount is a browser add-on for Mac computers, and, if you have this program on your computer, you should ignore Macdiscount Deals because they may direct you to insecure websites. Macdiscounter displays third-party advertisements and accepts no responsibility for the content of those advertisements. It is so because the developers of the program do not endorse and monitor the sponsors of the program, which means that you are responsible for your interaction with Macdiscount Deals. We recommend that you remove Macdiscount from your computer, so do not wait but take some action. Macdiscount Deals should not be trusted because they are likely to be as deceptive as some of the advertisements displayed by Less2Pay, RoyalCoupon, and other browser add-ons. Macdiscount is based on the JustPlugIt browser add-on creation platform, which is used for programs aimed at Windows and Mac computers. Macdiscount is very similar to Maccouponfinder, which is also aimed at Mac users, and bother programs are promoted on very similar website. Macdiscount Deals are displayed on almost every website you access, including ebay.com, amazon.com, target.com, and many others. If you want to bypass insecure websites, you should ignore Macdiscount Deals and remove the program from the computer as soon as you can. Macdiscount is available at macdiscount.info, but you should bear in mind that reputable security programs warn you about the installer once you click the download button. Another reason why you should remove Macdiscount from the computer is the fact that it records certain anonymous information. The Macdiscount browser add-on records clicks, search terms, browser settings, browser language, type of the operating system, and some other non-personally identifiable information. The program gathers information about you in order to provide you with targeted advertisements, i.e. advertisements that are based on your browsing preferences. In case you have installed Macdiscount by mistake and want to get rid of Macdiscount Deals, you should take action right now. First of all, it is crucial to pay close attention to the information that you are provided upon launching the setup file. Moreover, the system should be protected against malware and spyware, and we recommend that you use only reputable computer security programs. 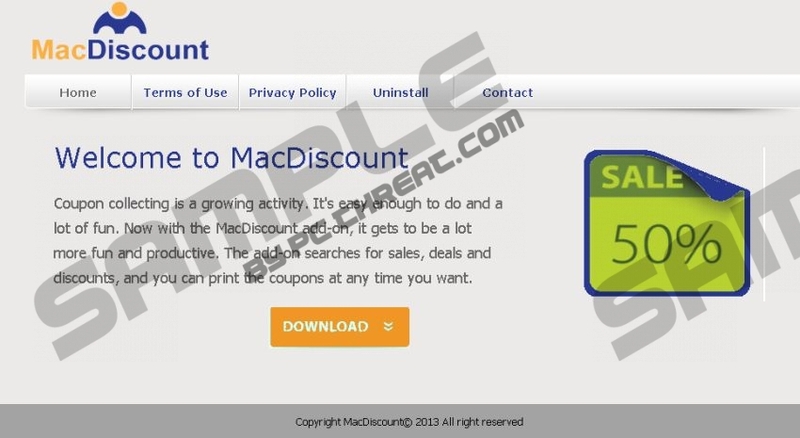 Below you will find our step-by-step instructions that will help you uninstall the Macdiscount browser add-on. If you have any questions regarding the removal of the program, feel free to leave a comment below. Click the Saferi menu button. In the Extensions tab, click MacDiscount. Quick & tested solution for Macdiscount Deals removal.